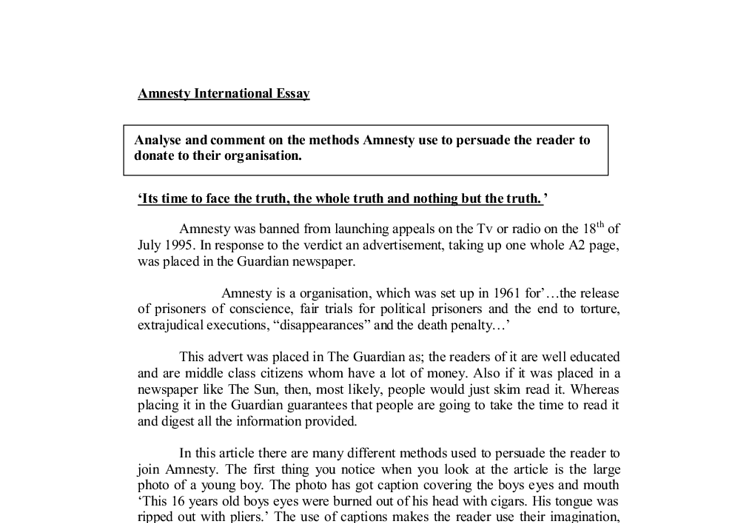 Analyse and comment on the methods Amnesty use to persuade the reader to donate to their organisation. Amnesty International Essay 'Its time to face the truth, the whole truth and nothing but the truth.' Amnesty was banned from launching appeals on the Tv or radio on the 18th of July 1995. In response to the verdict an advertisement, taking up one whole A2 page, was placed in the Guardian newspaper. Amnesty is a organisation, which was set up in 1961 for'...the release of prisoners of conscience, fair trials for political prisoners and the end to torture, extrajudical executions, "disappearances" and the death penalty...' This advert was placed in The Guardian as; the readers of it are well educated and are middle class citizens whom have a lot of money. Also if it was placed in a newspaper like The Sun, then, most likely, people would just skim read it. Whereas placing it in the Guardian guarantees that people are going to take the time to read it and digest all the information provided. 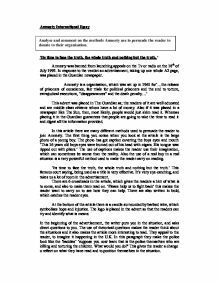 In this article there are many different methods used to persuade the reader to join Amnesty. ...read more. They appeal to the reader, to imagine it happening in the U.K. In this paragraph they make the police look like the 'baddies' 'suppose you now learn that is the police themselves who are killing and torturing the children. What would you do?' This gives the reader a change o reflect on what they have read and to position themselves in the situation. When you first think to yourselves, the police killing people.... It just doesn't add up but then when you read that there were witnesses who saw the police killing these people it changes your view on the law 'the bodies of children were found in a park in the capital city of a certain country. They had been horribly tortured before they died. Witnesses claimed that people who did it were police officers.' The second paragraph is written in a less formal way 'okay, your no firebrand...' by using humour makes the reader feel like the advertisement is about a very serious matter, but it also has a humorous side to it. ...read more. These sentences make you feel very upset and very guilty. The last few sentences of the article tells you how your can personally make a difference to what is happening 'joining Amnesty is the most effective way you can help them. Please do it today.' The application form then follows this sentence so people can donate to Amnesty. They try and make you feel as if, if you do not donate then these killings would carry on. In my personal opinion I think that this advert was very successful in persuading people to join Amnesty. I think they should not have been banned from making advertisements, as they are a very important organisation which save many innocent lives every day. The advertisement uses many different types of vocabulary, which can be understood by people aged fourteen and up. The only thing, which I think could have been improved in the advert, is the way in which they talk about politics. I think they talk about it too much, people who are reading the advertisement don't want to know about politics, and they just want to know about the torture and how Amnesty helps them. ...read more. The cost of the manufacturer-owned outlets is significant, as Goodyear has to maintain a management team for each store, as well as the capital expenses associated with that store. In addition to the expenses, Goodyear has come under fire in recent years by the independent dealers who were claiming that the manufacturer-owned outlets were cutting into their sales. Starting with �250 implies that this is what should be donated. Each month of the diary is a paragraph. This gives the impression that the writing is bitesize or easier to handle and wont take long to read. The language of the leaflet is very simple, so anyone could understand it. This gives the impression that the foundation helps many children lead a better life. The children pictured are also of many different races, religions, and ages. This shows that poverty is a worldwide problem, and not just confined to one particular country. The survey brought many issues to light such as the out look of restaurants with in the area of Surry and Hampshire and after calculating the relevant summary measures for the results from the survey we establish that the outlook is bordering unfavorable as the mean, mode and median all displayed an average of "3" which is slightly unfavourable. How does Amnesty International persuade people to donate money to their organisation through advertising? As she was arrested she said, "Kill me! It is better than being tortured!" However they continued to torture her and locked her up for several weeks. As the advert continues, "The men who raped and tortured Julieta are unpunished." The style of writing in telling this story includes very emotive words and ideas. How is language used in the Amnesty International adverts to manipulate the reader? Amnesty would like to ensure fair and prompt trials for political prisoners; and abolish the death penalty, torture and other cruel inhuman or degrading treatment of the prisoners, as well as ending extra judicial executions and disappearances. The leaflet is folded; it has six sections including the front and back pages. Analyse Coca-Cola as an organisation and to identify potential strategic growth opportunities. Although this indicates the size and power of the company, it may suggest that the CSD market has very little left to offer in terms of growth potential. According to Shepherd and Shanley (1998), there are two possible strategies that a market leader can adopt in order to promote organisational growth.